CANTERBURY'S finals hopes are just about done with after the Warriors downed them by 7 points at Mt Smart Stadium on Friday night. GET all the Late Mail ahead of tonight's battle between the Wests Tigers and the Gold Coast Titans at Campbelltown Stadium. GET all the Late Mail ahead of tonight's clash between the Warriors and the Canterbury-Bankstown Bulldogs. NORTH Queensland Toyota Cowboys co-captain Johnathan Thurston will undergo surgery for an injured shoulder and will not play rugby league again in 2017. ALL the results and scorers from the nineteenth round of the Betfred Super League. GET all the 19-man squads for Round 19 of the Betfred Super League, plus all the match officials. ROB Crosby gives his thoughts on Friday's meeting between the Wests Tigers and the Gold Coast Titans at Campbelltown Stadium. TIM Costello runs the rule over Friday's clash between the Warriors and the Canterbury-Bankstown Bulldogs at Mt Smart Stadium. IT is all set-up now. Queensland came back from 16-6 down to level the 2017 origin series at Stadium Australia in front of 82,259 fans. 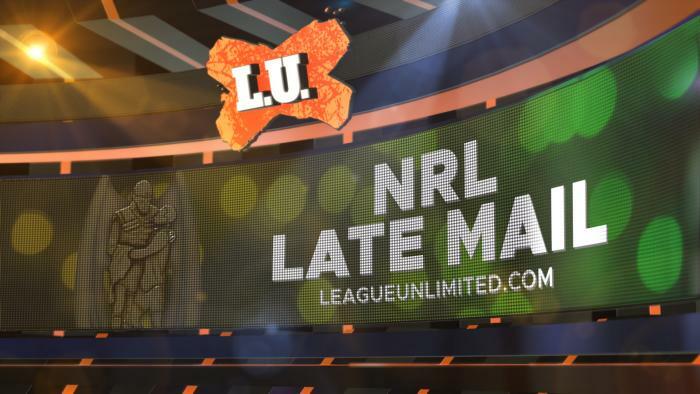 ​SAM returns to analyse all fourteen lineups ahead of NRL Round 16. IT'S Teamlist Tuesday for Round 7 of the 2017 QRL FOGS Colts Challenge Season! Every Tuesday, the full teams for each #FOGSColts round will be posted right here! IT'S Teamlist Tuesday for Round 16 of the 2017 QRL Intrust Super Cup Season! Every Tuesday, the full teams & officials for each #IntrustSuperCup round will be posted right here! IT'S Teamlist Tuesday for Round 7 of the 2017 NSWRL Harvey Norman Women's Premiership Season! Every Tuesday, the full teams for each #NSWWomens round will be posted right here! IT'S Teamlist Tuesday for two catch-up matches in the 2017 NSWRL Sydney Shield Season! Every Tuesday, the full teams for each #SydneyShield round will be posted right here! IT'S Teamlist Tuesday for Round 16 of the 2017 NSWRL Intrust Super Premiership Season! Every Tuesday, the full teams and officials for each #IntrustSuperPremiership round will be posted right here! IT'S Teamlist Tuesday for Round 16 of the 2017 Holden Cup NYC Under 20's Season! Every Tuesday, the full teams for each #HoldenCup round will be posted right here! ALL the results and scorers from the twelfth round of the BRL A Grade In Safe Hands Cup. ALL the results and scorers from the Quarter Finals of the English Challenge Cup. Includes Round 16 Super League result for Giants v Saints. RICK Edgerton runs the rule over the upcoming clash between the New South Wales and the Queensland.